The 30-page color Get Organized Muslima Planner is the first of its kind! It is tailored towards the busy Muslima who wants to set goals towards improving her deen. Have you ever felt that your ibadah is neglected? That you cannot find time to do more than your fards? Have you longed to feel closer to your Lord? And wished to achieve your goals of strengthening your imaan? The Go Muslima Planner will help you to become organized in your deen goals towards reaching a higher level of taqwa, and formulating good habits to increase your bounty for the hereafter inshAllah. The planner has goal-setting printables to help you keep track of missed prayers and fasts, as well as motivate you to make time for your many spiritual aims, like the recitation of the Quran, reading Hadith, keeping up with duas, becoming more charitable and setting time for the study in areas of deen. A chart to mark off days of missed prayers from your past. You calculate the time prayer was incumbent on you, and estimate how many prayers you have missed till now in each salah. Then you write down your estimation and mark an x on your Salah Qada Log each time you repay a salah. If you are trying to instill sunnah prayers more often alongside your fards, keep a log of it. This will help motivate you to formulate it into a habit. Special salah is a wonderful way to achieve closeness to Allah, to find patience and peace, pray for extra wants, and towards higher guidance and reward. Decide on which prayers are relevant to you and log it in your Special Salah Log, so you remember next time which prayer you performed. A chart to help you mark off the days of your missed fasts in Ramadan from your past. Many moms have multiple fasts to make up from periods, pregnancy, childbirth and breastfeeding. Estimate your missed fasts from the age of puberty and write the total. Decide when to make it up, and mark an x on your Sawn Qada chart for each day you repay. This log is for additional fasts that you hope to pursue outside of Ramadan. It can serve as a reminder for the special days of fasting or if you wish to fast on the Sunnah days such as Mondays and Thursdays or 3 times per month. To remind and motivate you to keep up your frequent recitation of Quran to formulate the habit of instilling Quran regularly in your life and aim for an increase in a daily recitation. This is where you log the Hadith you read, to motivate you to read it side by side with your Quran recitation and see a progression in your readings, to remind and motivate you to keep up frequent enrichment from Hadith. Log your daily morning and evening azkar to remind you to recite your important duas daily. The dhikr that you wish to say at specific times of the day can be logged here as well. This page helps you to remember which ones are important to say and when. To motivate you to perform more charitable acts more frequently. It is meant for you to see your trend of giving for the sake of Allah. This chart will log your charitable deeds to motivate you to perform more good deeds throughout the day by seeing your trend of deeds over time. Two charts are divided into Self, Family, Home & Other, for you to write down all you wish to ask Allah when making dua. We don’t remember all we want when we are saying dua, so your log ensures that you don’t forget. You can add more as the need arises. Being honest by writing down any bad traits you wish to remove from yourself and to seek repentance for them with the intention to not repeat them. For you to reflect on all your blessings and to show thankfulness to Allah for His blessings upon you as you realize how much you have. To be filled each time you think of another blessing you have. To motivate you to study the areas of deen that you may need reinforcement or lack knowledge and want to improve. It is incumbent on a Muslima to improve her ilm of deen. Setting your goals and aiming towards this knowledge is making the intention, which is the first step. This is where you can aspire towards your goals for your child to learn deen, how often, and then ensure it is being implemented. You can add multiple children. A page to share your spiritual thoughts regularly so you can see improvement in yourself, or to jot down any frustrations you have. This will help you to realize if you are trying to do too much too soon. So go ahead and make your intention to reach your spiritual goals! 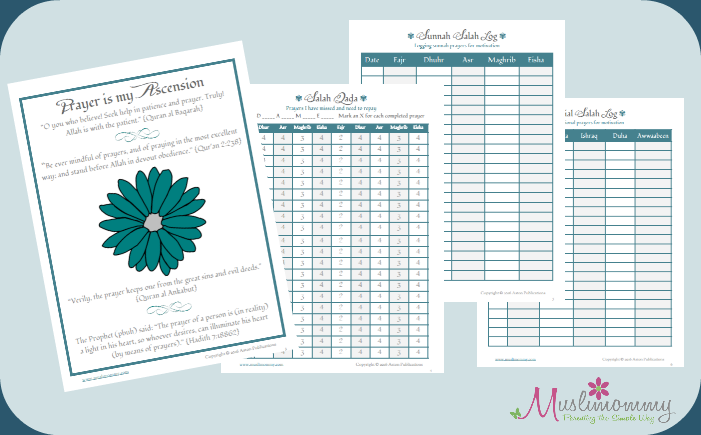 The Muslima Planner will help you begin your spiritual journey.